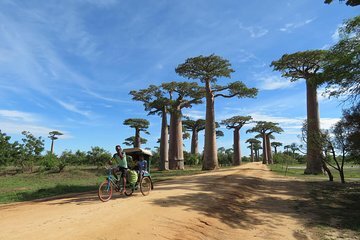 Combine two of Madagascar's top attractions—Kirindy Park and Baobab Avenue—on this full-day tour from Morondava. Take in sights of Madagascar's natural landscape, including deserts, wildlife parks, beach vistas, and unusual vegetation, while learning about the area through a guide's insightful commentary. All included transportation means you can skip the hassle of renting a car and leave the navigation to someone else while focusing on the sights.